Sherlock Holmes the Hunt for Blackwood is a superbly designed, 5 reel, 30 payline video slot centring on Arthur Conan Doyle’s famous consulting detective. This version is based on the recent movie franchise which stars Robert Downey Jr as the pipe-smoking sleuth and Jude Law as the trusty Dr Watson. Features on offer include mystery multipliers, pick me bonus prizes as well as plenty of free spins. Head to Baker Street from 60p per spin. 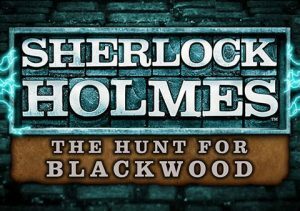 The design in Sherlock Holmes the Hunt for Blackwood is very impressive – the visuals have a strong Victorian feel and the action plays out to a delightfully eccentric backing track. Set against a stained glass window backdrop, the reels include a selection of pipes, magnifying glasses, pocket watches, violins and dogs. Mystery Multiplier feature – hitting at random, the Mystery Multiplier can land on any spin and boost your payout with a multiplier of anything up to 10x. Teamwork feature – on any base game spin, the Holmes and Watson symbol can combine to form a single symbol. Instead of offering payouts of up 100 coins as singles, the combined efforts award up to 300 coins. Picker Puzzle feature – land 3 Bonus symbols anywhere on the reels to trigger this. You’ll then be taken to Sherlock’s room which is filled with violins, globes, busts, books, posters, clocks, bottle, statues and pipes. Pick 5 of them to win cash prizes or trigger 1 of 2 bonus features. The Hunt Bonus feature – landing 3 or 4 relevant objects from the Picker Puzzle round will get you 10 or 15 free spins. These games are played out on a new set of reels featuring a different range of characters. If the Holmes or Watson symbols land on 1 of the 5 positions that mark a Blackwood crime, they will become a locked wild for the remainder of the free spins. Lock all 5 positions and all prizes earned in the feature and the Picker Puzzle round are doubled. The Blackwood Wheel Bonus feature – land 3 or 4 wheels in the Picker Puzzle to trigger this round. It’s a classic spin the wheel feature with cash prizes on offer depending on where the pointer lands. The aim is to try and avoid the dastardly Blackwood (Mark Strong). After the 4th and 8th spins, extra bonus-ending Blackwood symbols are added to the wheel but so too are bigger prize segments. You’ll start with 3 spinners – if 1 of them lands on a Blackwood, it is deactivated. Land on a Sherlock though and you’ll re-activate all of your pointers as well as pocketing a bonus prize. You’ll receive 10 spins in all. If 1 of your pointers is still active at this stage, you’ll be rewarded with a 2x multiplier with all prizes doubled. There’s much to like in Sherlock Holmes the Hunt for Blackwood – the design is terrific, just the sort of high end offering you’d expect from a big studio movie adaptation. The features cut the mustard too, offering a nice variety. We’d put the variance in the medium range. If you’re a Holmes fan, then this video slot is a must. If you’ve never succumbed to the charms of Sherlock, whether Rathbone, Brett, Cumberbatch or Downey Jr, this top notch adaptation may win you over. If you like detective themed games, Playtech’s Ace Ventura Pet Detective is worth trying.